I've played ME2 and 3 on my PC, but I didn't have enough time to finish third one because at that time I had to focus on writhing my thesis and graduation exams, and when I've finished all my school work I moved to US and left my computer at home. So now I've started the story from beginning. Too bad I couldn't use my PC save from ME2 with my old Shepard. Especially because without it I'm missing my romantic conversation with Garrus at our time of reunion on Normandy hi hi <3 Ahh, this scene was sooooooo adorable! At the moment I mostly playing multiplayer mode and trying to unlock some new characters. I want some cute Quarian girls to play with but instead in my Reinforcement Packs I got mostly Krogans and Volus... Fortunately I was lucky enough to uncover Fury, so I can play with cute character not necessary covered from head to toe in heavy armor. Yes, I know choosing characters based on appearance isn't the most efficient way to play, but I'm just fairy me and I like my charterers to be pretty hi hi. Maybe it's a little bit shallow by I have better contention with visually appealing characters. I'm trying to look good in my real life so I can have some demands from my game characters to, especially in online mode when I identify whit her. Again if anyone is playing ME3 on PS3 and would like to join up for some nice game together my id is Demon_Emily. I would post photo of my new Shepard here, but she look so ugly, I can't even look at her in cutscenes. Instead, here's my dear Garrus. Ok, now time to start what I really wanted to write about in this post. 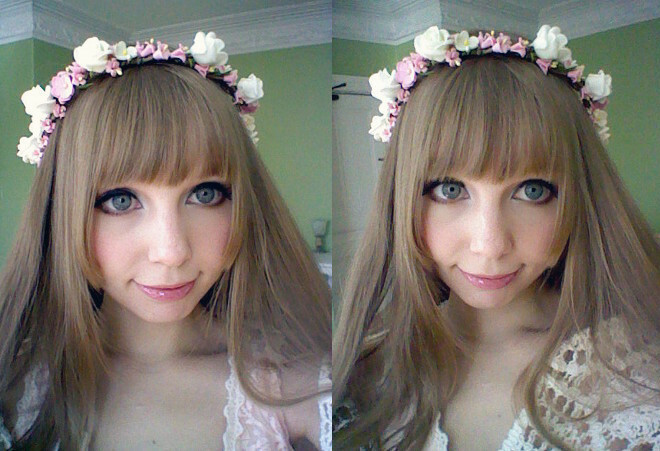 My first circle lenses review! 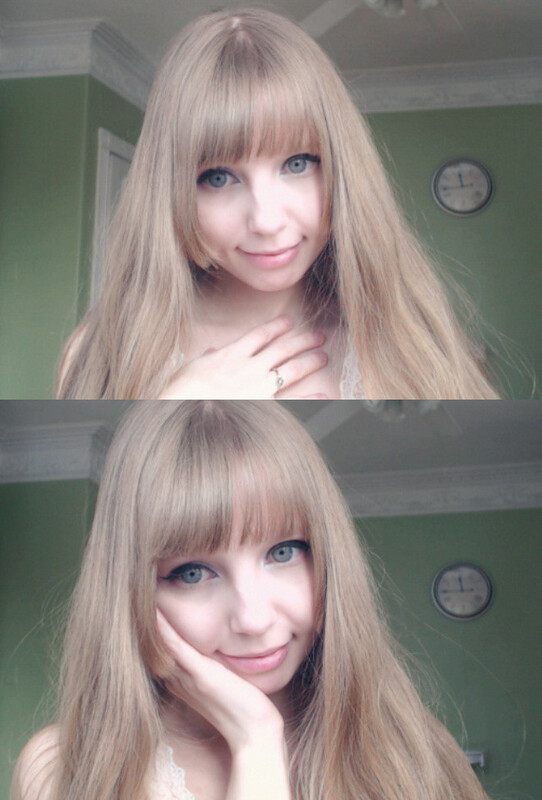 For a long time I wanted to try some nice circle lenses, but my husband never was convinced to them, so not to bother him to much, only every now and then I mentioned something. He alsywas was saying that I already have big eyes and don't need them to look cute but in the end he said yes, as long I will remember to use it correctly so I wont hurt my eyes. The lenses it self are very cute. Pattern is delicate, without outside black circle. They look very natural on eyes, enchant it but don't look fake. They give to my eyes this little spark, making them just a little bigger and cuter but not unnatural. Probably someone passing me by wouldn't notice lenses but would definitely think that I have big eyes. When it comes to comfort keeping in mind that's my first pair I would say they are comfortable but not perfect. They doesn't irritate my eyes or feel uncomfortable but still I can "feel" them tough I'm not sure if there are circle lenses that you can just put in your eyes and forgot for few hours that there's anything inside. Simple make up, just a little bit of eyeliner and mascara. Natural lightning, photos made with pc camera. And only my eyes. Photo made outside, with Sony camera. I'm very pleased with this lenses, and I think it was wonderful choice. Another thing is that my husband always hated circle lenses but thanks to this pair he changed his opinion and he even asked me if I want another pair and that made my mission accomplished hi hi. Thanks so much for this review, but I have a suggestion, if that's okay. Could you take photos of your eyes before you put the contacts in? I have no idea how good the enlargement is because I'm not too sure what to compare it to. This review would have been 100x more helpful if that was the case. You look even more beautiful with these lenses. They are very natural! You look beautiful with lenses. The lenses suit you so well, they are very natural looking. I remember being terrified the first time I wore circle lenses as well, but you do get used to them after some practice. When you wear them for long periods they do start to dry your eyes which can you more prone to infections. As long as you take breaks from wearing them I don't think they are too harmful, they are a nice accessory to have! Ojej, niesamowicie miło mi było czytać twój komentarz.